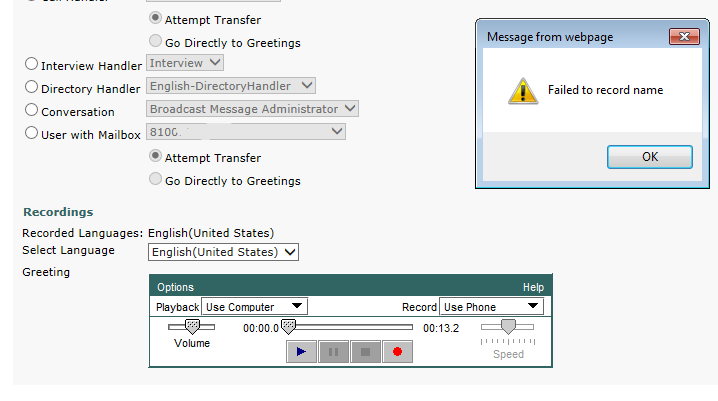 While uploading greetings in Cisco Unity Connection call handlers using Media Master Applet, you might encounter the error “Failed to record name”. Even though you might have tried with different versions of java but you still receive the same error? There is a workaround rather than a solution i would say. Login to Cisco Unity Connection and Locate to the call handler in which you need to upload the greetings. Before you attempt to save the configuration, you need to apply the workaround in the below step. Unity Connection will try to play the Greetings using IP Phone if you have specified any valid IP Phone extension else it will fail to call the number. You will notice that your greeting has been updated/saved. Click on Play/Record again and verify if the greeting has been successfully uploaded and it is being played correctly. That’s all. I have personally tried this workaround and it works like charm. If you use the playback option as “Use Computer”, the greeting upload will not work. It worked indeed! Thanks a lot! Thank you for the confirmation Luiz! Cheers!